... his outlook, his reliability, his er where his loyalties lie would be in question. What? Because his middle name is Hussein? Because his dad and step-father were Muslims? Because he went to school in Jakarta? Because he wore a sarong in Indonesia, just like thousands of Australian tourists do when they visit that country? 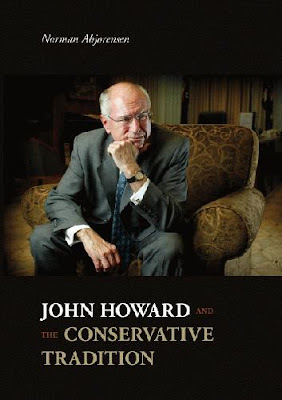 One of Australia's most prominent political commentators, Norman Abjorensen, has just published a book entitled John Howard & the Conservative Tradition. Anyone living in Canberra can attend the launch of this book by Humphrey McQueen on Wednesday November 12 2008 at 5:45pm at the Paperchain Bookstore located at 34 Franklin Street Manuka. Abjorensen was one of Crikey's resident (if it's possible to have a physical residence online) commentators on the 2007 Federal Election. Abjorensen has also authored a biography of former Liberal Party leader Dr John Hewson, and was former national editor of the Sydney Morning Herald. COMMENT: Daniel and Gabby weep. Let's celebrate! Well, this prediction was badly wrong. To explain it away, I could point to the fall's financial problems, the media's bias, or to the McCain campaign's many errors, but there's a deeper issue here. I had confidence that the American people would reject Obama when they learned about his extremist political views, dubious associations, and biographical mysteries. I am astonished that these problems hardly registered, I feel bewildered by my own country, and apprehensive by what comes next. Remember ww2? Hitler was the same type, a cult of personality and slick propaganda of goebbels, Stalin, Lenin, they all lied didn't they and gullible people still followedd them, the ends justifies the means. Anyone remember how they rise to power ended up? I do. God help America under Obama. Obama-he admits his brothers and sisters all are muslims, yet he admits his dad and step dad was muslim. Yet, still he persisted and continued to persist with the lie he was not amuslim nor ever was which is orwellian in the extreme of denialibility. "plausible or believable deniability". Majority of his borhters and sisters are still in poverty in Kenya. If you tell a lie often enough it will be told as fact. You just need to read read about the koran to know its all lies. "War is deceit muhammad said". Well America is at war, and teh greatest liar has been elected. Indeed , War is deceit. His cousin ODINGA in Kenya he gave a million dollars to and helped advise and electioneer for "cuz"odinga is a rabid jihadst whom has forced shariah law on the population of 90 per cent non muslims in that land. The rest of his kenyan family celebrated his victory as "obama is a son of kenya" son indeed, he was born in Kenya in front of his black african kenyan muslim grandmother who admitted it during a telephone call to a certain Bishop. His family still are por in kenya, I wonder with bro obama as president how many free citzenships will he hand out- ODinga? his brothers and sisters aunties uncles, why stop there. Let the whole fricken tribe in. Bet he will. Comments are screened for relevance, substance, and tone, and in some cases edited, before posting. Reasoned disagreement is welcome, but comments are rejected if scurrilous, off-topic, vulgar, ad hominem, or otherwise viewed as inappropriate. If you want to see Daniel Pipes in person, watch out for his next Australian tour, perhaps again sponsored by AIJAC and/or the Centre for Independent Studies.